I got up early on Sunday to make a treat to take to Gail’s house (and for us to have a treat too!) 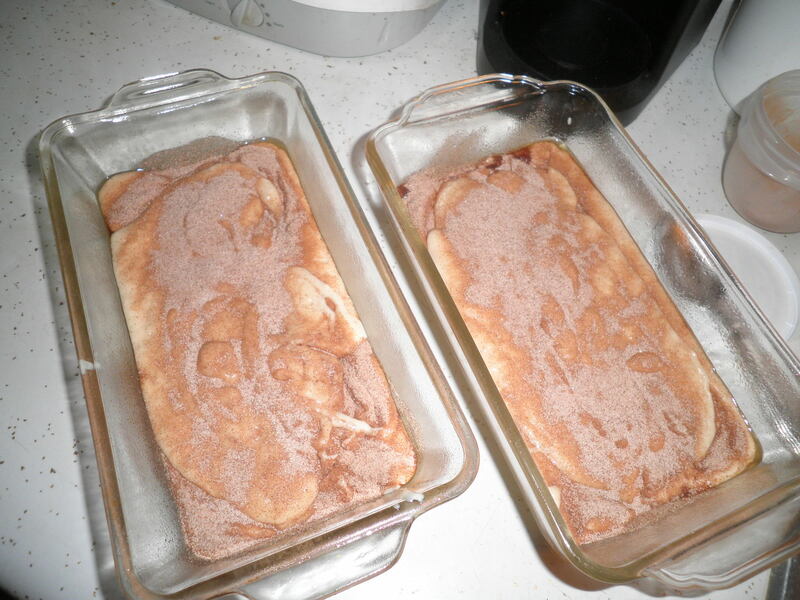 I decide I’d make the cinnamon loaves I’d made a week or so ago. My mission this time…to lighten up the recipe. As I made it last time, a 1/12 serving of the recipe counted as 8 points. It’s delicious, there’s no doubt, but I hate to use up 8 points on a treat. I knew I could do better. Instead of using 1/2 cup of canola oil, which added 28 points to the overall recipe for a total point value of 93 points, I used sugar-free applesauce which counts for “0” points! It reduced the overall value of the recipe to 65 points. This makes each serving 5.41 points. Unfortunately, on the new program you have to round up to the next point so it comes out to 6 points per serving. Still better! I started thinking though that I might be able to lighten it up a little more. I calculated it with egg substitute rather than regular eggs. Real eggs add a total of 4 points, while egg substitute only adds 2 points. That brings it to 5.25 points per serving…still 6 points. This morning I thought about checking the milk. I had used 2 % milk for 1 point. Unfortunately, changing it to non fat milk is still 1 point. So it seems we’re stuck at 6 points. I’m thinking of looking into egg replacer to see if that would help the count. Did any of you who know me well, EVER think you’d see so much Math on BCDC?!? 😉 I didn’t either, but I’m enjoying this challenge and I’ll probably try to continue it with other recipes. I like a challenge! Another comment on this whole process…just because a container of something (sour cream in this case) is 16 ounces, doesn’t mean you’ll get 2 cups out of it. I was a little shy on sour cream, but that didn’t seem to make a difference. 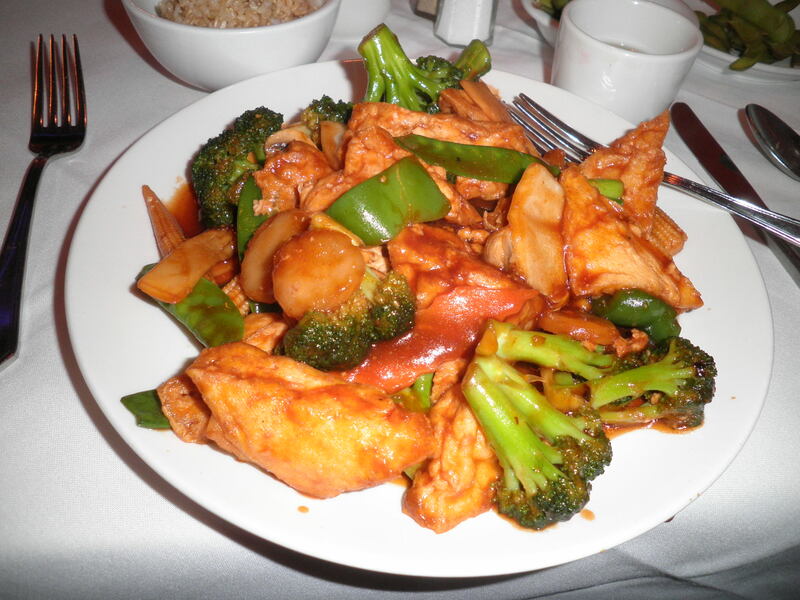 Dinner last night was the left overs from Saturday night’s Chinese dinner. Here it is Monday and it’s dreary and damp outside. I have lots to accomplish before I go over to Gail’s again, to help. I’m learning a LOT about baseball and catching up on a lot of shows On Demand. It’s fun to spend so much time with old friends. I just wish it was for a different reason. We’re all trying to make the best of it. 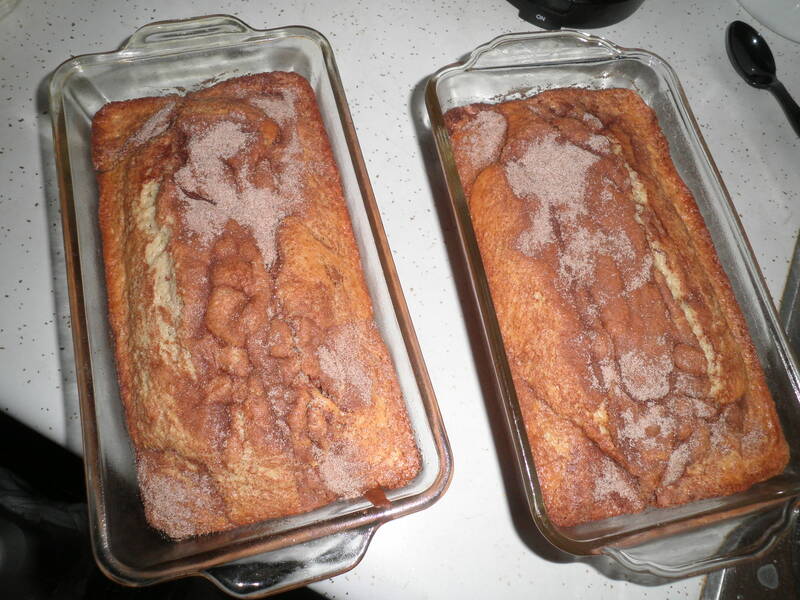 This entry was posted in Uncategorized and tagged baking, reduction, Weight Watchers. Bookmark the permalink. those loaves look great! thanks for sharing 🙂 happy monday to you too!